It was the 6th of April and I was in a plane beginning to descend to Kigali, the capital of Rwanda. I had been asked by the Connexion to represent Methodism at the 20th anniversary of the Rwandan Genocide. The captain of the plane announced that we would be put in a holding pattern for a time as so many planes were arriving for the commemoration. The time moved on; it was after 8 and approaching 8.30 when it occurred to me that precisely 20 years beforehand there had been another plane approaching Kigali airport. It had on it the Presidents of both Rwanda and Burundi and other officials from the two governments, as well as the French plane crew. At approximately 8.30 the plane was shot down by a rocket launched from Kigali, as it made its final approach to the airport. It was the trigger that launched the Rwandan genocide. Exactly twenty years later, the plane I was on was about to land! Fortunately for me, our plane was given a slot to land and we arrived safely at the airport. A poster greeted us: “Kwibuka 20”, Kinyarwanda for Remembrance. The poster had underneath it the three focus words for this 20th anniversary ‘Remember, Unite, Renew’. The following morning the Commemoration began with the laying of wreaths at the Kigali Genocide Museum and a major event at the AmahoroStadium where world leaders including the General Secretary of the United Nations, Ban Ki-moon and the President of Rwanda, Paul Kagame, spoke movingly about the tragedy of the genocide in Rwanda and the failure of the international community to give an adequate response to what was taking place. It is now thought that 1,050,000 people died in 100 days, more than 10,000 every day. 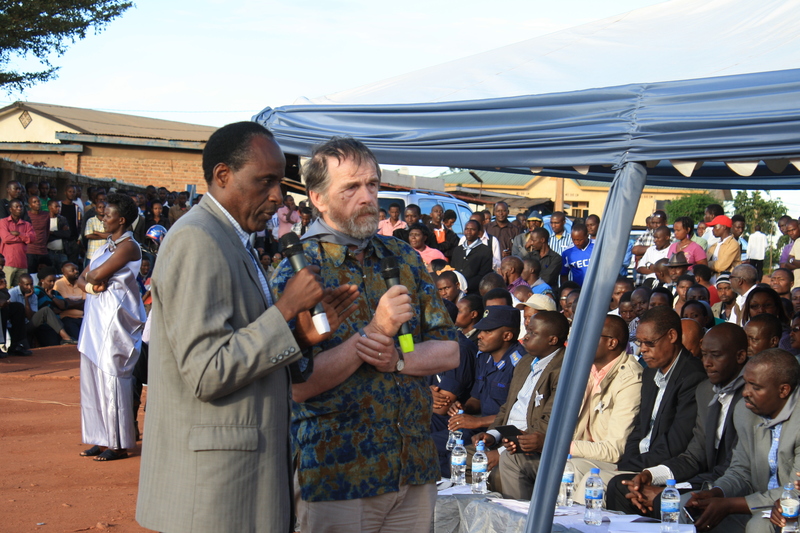 Rev John Howard addresses the meeting at Gikondo, with Anansyase Rukirangoga as translator. Mid-afternoon on 7th ,and I was with Bishop Samuel the leader of the Free Methodist Church of Rwanda and other people from the church on the “March to Remember,” a walk from the Parliament Building to the AmahoroStadium, where a second event was to take place. As we gathered at the Parliament Building, I was aware of how young were all of those around me. Fifty per cent of Rwanda’s population is aged 20 or under. They are a new generation growing up after the genocide and bringing a very different approach to the life of the country. The slogan ‘There are no Hutusor Tutsis; we’re all Rwandan’ has echoed through those 20 years, in order to build a new nation with a future that seemed then to be impossible. As we marched, the security was evident; the march was being led by President Paul Kagame, and many of his Rwandan Government were present, as were Tony Blair and William Hague. Many of the taller buildings along the route had observers from the Rwandan Army stationed on top of them, ensuring that the march passed off in safety. On arrival at the Amahoro Stadium, Bishop Samuel, Anastase Rukirangoga and I were welcomed into the guest seating area. We were fortunate enough to be seated just two rows behind President Kagameand had a good opportunity to talk with some of those present. We were also ideally placed to hear the speeches. I was given an English translation machine so that I could understand what was said in Kinyarwanda. I was conscious that half the speeches were in English and no translation was given into Kinyarwanda for those who did not understand English. 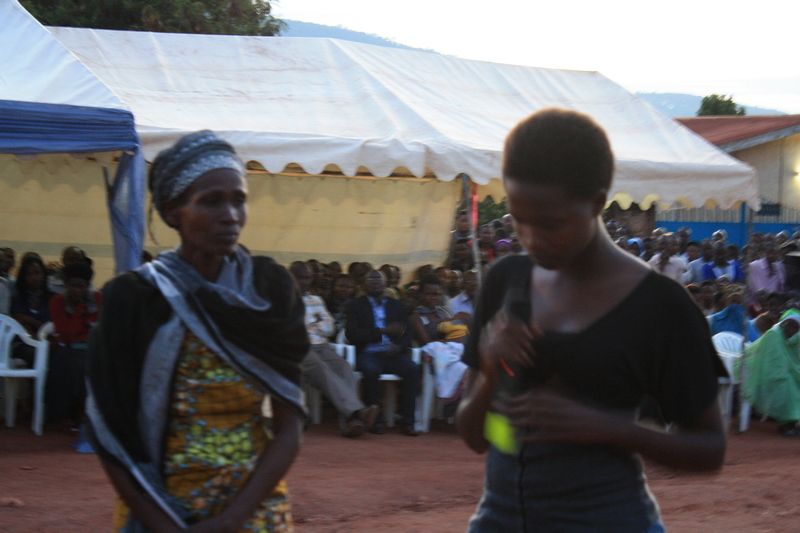 The programme continued with speeches, drama and music. Most dramatic for me was when hundreds of young people lay as dead on the grass and soldiers moved around the “bodies.” Twenty years ago this was the experience of the Rwandan Patriotic Front soldiers, as they captured the country ending the genocide. The drama brought it to life once more. The 20th Commemoration of the Rwandan Genocide had begun. The following days were arranged in a very structured way. The 7th April saw the launch of the commemorations as national events; the succeeding days saw the sector events (sectors of the country being areas with populations of about 250,000). Then later in the week the commemoration took place in local towns and villages before the event which rounded off the week on Sunday 13th at the “Commemoration of Heroes” monument on a hill above Kigali. I therefore went on Tuesday to the sector meeting at Gikondo, a part of Kigali. About 10,000 people gathered, some under hastily erected shelters, others out in the open air, and a series of speeches were given. Some of them were from government officials talking about the importance of security, or of the right understanding of what took place in the genocide, but some of the most moving speeches were by survivors of the genocide. One lady particularly caught my imagination. She was a relatively poor Hutu lady who described how she rescued a Tutsi baby in the genocide and was threatened and insulted by members of her own family. She said with tears in her eyes even now 20 years later she is in fear of some members of her family attacking her when they are released from prison in the near future. At the end of the testimony a young lady of about 20 years of age came and stood next to her. She had been the baby the lady had rescued, now a young woman. She briefly, but movingly, spoke in thankfulness for what the Hutu lady had done for her. I was asked to respond on behalf of the international community. I was the only international present at the time. I tried to express some of the emotions that I felt as a result of being at this most moving occasion and I included an acknowledgement of the failure of the international community to adequately respond to the situation in 1994. I was in many ways echoing what Ban Ki-moon had said in his speech at the Amahoro Stadium. One of the impressive features of this event was the care given to individuals present who broke down and wept. There were many people who did so, men, women and children, each breaking down into tears as a result of something that had been said and memories that had been reawakened. Wearing grey smock s, there was present a team of ladies, who had been trained and were ready to respond. They brought tissues (in reality pieces of toilet roll) to those who broke down and wept and stood by them, gently giving support until the person was in control of themselves again. The event lasted over 4 hours and it was a great privilege to be present. Later in the week I attended a further event of a more local nature. Once again, it was a combination of particular tributes and speeches speaking about the appropriate responses to what had taken place. I was particularly struck on this occasion by Julienne,one of the leaders of PHARP (Peace Healing of Reconciliation Programme) talking about the appropriate responses to trauma and how individuals could help others for whom the trauma of the genocide is still very fresh. I left Kigali with a deep sense of the level of grief that remains on the part of so many people. One of the phrases that came out on a number of occasions is that “every person has a story.” How true that seemed – some of how they became perpetrators of the genocide, some of how they suffered as victims, some of how they were outside the country at the time and how they agonised about what was taking place. Once again I felt deeply honoured and humbled by the great hospitality of the people of Rwanda. The country has been transformed from utter destruction, to one with a positive vision for the future. Major problems remain but the achievement of the Rwandan people has been remarkable. Kigali has become a modern, bustling city with tower blocks and shopping malls. There is a real unity evident especially in the younger people, where previously the Hutu/Tutsi divide dominated community life. There remains the challenge of poverty, especially in rural areas and the continuing need to support people who, twenty years ago, went through unimaginable trauma. Perhaps soon, though, Rwanda might be known not simply for the genocide but for the beauty of its countryside and the spirit of its people.